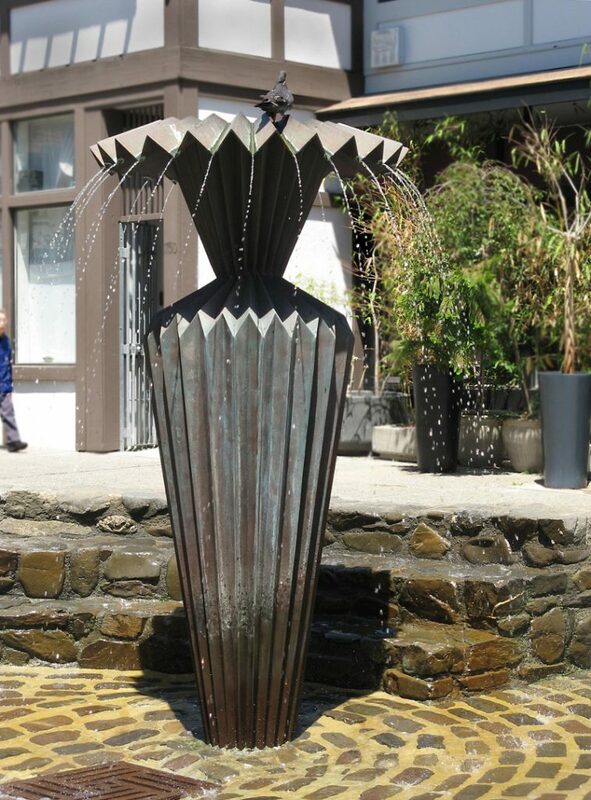 One of Ruth Asawa’s origami fountains in Japantown when the water flowed. 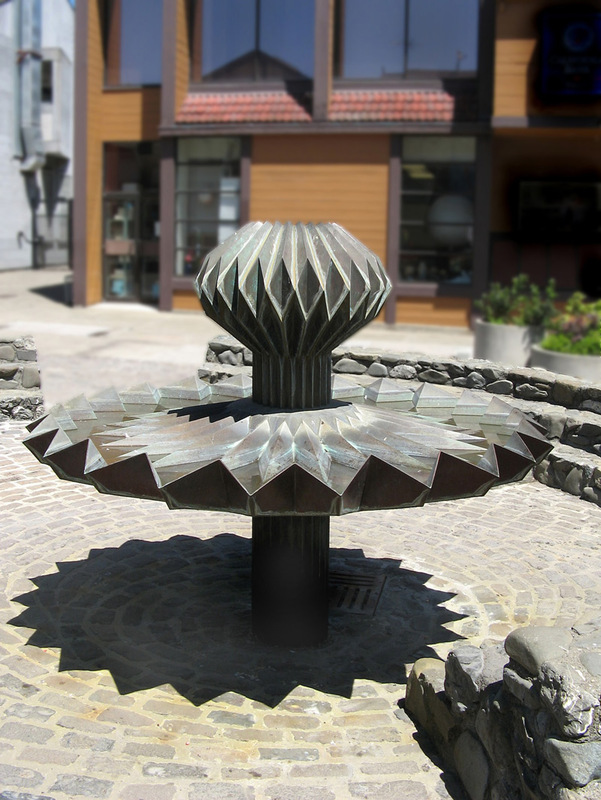 It’s hard to find people in Japantown these days who remember when the water stopped flowing and the once-lovely fountains on the Buchanan Street pedestrian mall became two interesting but somewhat curious sculptural objects. 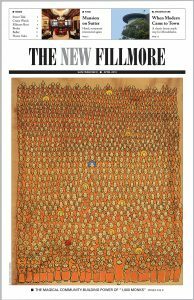 This is not what widely beloved, internationally renowned San Francisco Japanese-American artist Ruth Asawa had in mind when she created them four decades ago. Yet it is not clear when — or whether — anything will be done to reclaim and restore the fountains. 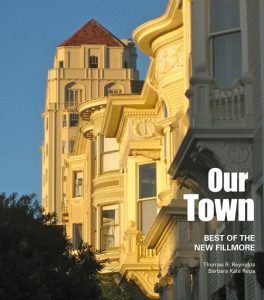 The Buchanan mall, constructed in the mid-1970s as part of the Redevelopment Agency’s urban renewal project in the Fillmore and Japantown, was designed by architect-planner Rai Okamoto. It was intended to be reminiscent of Tokyo’s Ginza district — a pedestrian-only area known for shopping and dining. An entry gate was constructed at Sutter Street where Buchanan becomes inaccessible to cars. It resembles a Torii gate similar to those that traditionally welcomed visitors to Shinto shrines or Japanese gardens. Ruth Asawa was all about welcoming. She was an unassuming woman who devoted her life to arts and education. Funding for the Ruth Asawa School of the Arts at 135 Van Ness Avenue is part of the Yes on A initiative on the ballot in November. Asawa was a Nisei — a second-generation Japanese-American — who bore no ill will toward the government that sent her family to an internment camp during World War II. Her fountains were part of the area designed to bring a sense of welcome and peace back to many of those who shared the upheavals of the internment camps and further displacement during redevelopment. The original metal origami fountains, designed to resemble flowers of folded paper, became corroded and were removed following a long drought in the early 1970s. But public outcry brought back bronze replicas, also created by Asawa, to a revitalized Buchanan mall in 1999. 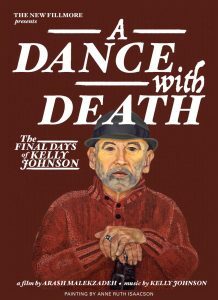 At that time, they were officially designated as part of the city’s art collection by the San Francisco Arts Commission. However distinctive and clear their history, the future of the fountains remains murky. Uncovering why they have not been restored involves working through a maze of bureaucracies. Without water, the fountains have become two somewhat curious sculptural objects. The mall is owned and operated by the Nihonmachi Parking Corp., with the open space under the general dominion of the city’s Department of Parks and Recreation. Because of the nature of the mall, it also falls within the ambit of the city’s Office of Economic and Workforce Development. Because they are part of the city’s art collection, the Arts Commission oversees the fountains, which are maintained by the Department of Public Works under an agreement with Nihonmachi Parking Corp. The mall is in San Francisco’s District Five. Getting the attention of that number of corporate, political and bureaucratic entities has probably never been easy. But they did all cooperate to request an “Investigation of the Fountain Sculptures and Infrastructure,” which was undertaken last year by ARG Conservation Services. ARG investigated the site and submitted a detailed report, complete with schematic drawings, photos of the plumbing and an explanation of the malfunction. Fountains are notorious for being clogged by cigarette butts and litter, and these are no exception. And thereby hangs the tale. ARG submitted its draft report to all concerned on February 10. An itemized list of “fountain rehab” costs totals $437,177.34. So far, no one has stepped up to raise the money and implement ARG’s report. Supervisor London Breed, in whose district the fountains lie, did not respond to several messages requesting comment. Meanwhile, two treasures of Japanese-American culture — and the city of San Francisco’s art collection — continue to deteriorate.